Dan's creation has an interesting story behind it. Back when Street Fighter II had just become popular, SNK released a game called the Art of Fighting. The game was an obvious rip-off of SFII, and it's heroes, Ryo and Robert, looked similar to Ryu and Ken. This did not go unnoticed by Capcom. 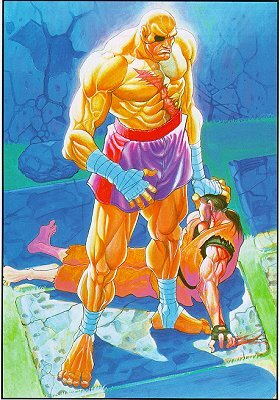 When they released artwork for SFII Turbo, Sagat was seen holding the battered body of a fighter, who looked like Robert in Ryo Sakazaki's clothing. (For a look at this picture, click here). Then, when it came time to make Alpha, the programmers included Sagat's battered adversary as a secret character and called him Dan. Dan's moves, especially his Gadoken and Koryuken, are very similar to the watered-down moves found in the Art of Fighting. Last, but not least, Dan's custom combo symbol is like the mask Ryo's father wore in the Art of Fighting.